The influence of fission-fusion dynamics, i.e., temporal variation in group size and composition, on social complexity has been studied in large-brained mammals that rely on social bonds. Little is known about birds, even though some species like ravens have recently received attention for their socio-cognitive skills and use of social bonds. While raven breeders defend territories year-round, non-breeders roam through large areas and form groups at food sources or night roosts. We here examined the fission-fusion patterns of non-breeding ravens over years, investigating whether birds meet repeatedly either at the same or at different locations. We combined four large datasets: presence-absence observations from two study sites (Austria, Italy) and GPS-tracking of ravens across two study areas (Austria, France). As expected, we found a highly dynamic system in which individuals with long phases of temporary settlement had a high probability of meeting others. Although GPS-tagged ravens spread out over thousands of square kilometres, we found repeated associations between almost half of the possible combinations at different locations. Such a system makes repeated interactions between individuals at different sites possible and likely. 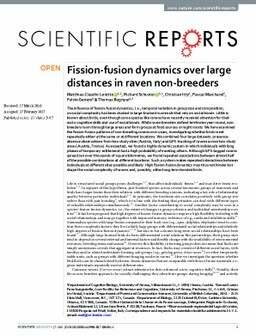 High fission-fusion dynamics may thus not hinder but shape the social complexity of ravens and, possibly, other long-term bonded birds.